Chapter 1: Stone tablets, paper and the Internet: the same old library? Chapter 2: Strategic planning, organizational goals and technology: what and for whom? Chapter 5: Evaluation: is technology meeting the needs of the organization’s users? 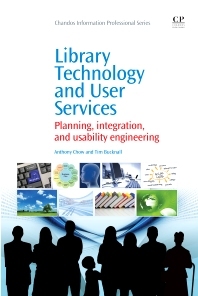 Written as a technology guide for students, practitioners, and administrators, the focus of this book is on introducing current and future trends in library technology and automation within the larger context of strategic and systems planning, implementation, and continuous improvement. Technology is an essential resource for attaining both organizational and patron goals, and planning needs to emphasize the alignment between the clearly defined goals of each. For this alignment to occur on a consistent basis goals must be designed, or engineered, in a systematic fashion where technology fulfils the need to deliver the desired outcomes in an efficient, cost-effective manner. The concept of usability engineering is also examined, where the technology is planned, designed, and implemented in such a way as to maximize utility and ease-of-use for users and employees. Readers of this book will understand both the why and the how of library technology, planning, and implementation articulated in a simple, easy-to-understand fashion. Dr. Anthony S. Chow teaches library management and technology as an Assistant Professor in the Department of Library and Information Studies at the University of North Carolina at Greensboro. Anthony also serves as an educational consultant specializing in online information and evaluation systems and has overseen the IT for a large academic unit, managed training and quality assurance for an Internet company, and oversaw computer based instruction training for a government agency. His dissertation was published as a book entitled Systems Thinking and 21st Century Education. Assistant Professor in the Department of Library and Information Studies at the University of North Carolina at Greensboro. Tim Bucknall is Assistant Dean of Libraries and Head of Electronic Resources and Information Technologies for the University Libraries at the University of North Carolina at Greensboro. Tim is responsible for many significant library innovations, including the first OpenURL link resolver to go into production, and the first large-scale virtual library consortium. He was recently named by Library Journal as one the United States’ leading ‘Movers and Shakers’ within librarianship, and has published and spoken extensively on library information technology, IT management, and effective evaluation of electronic resources and services within libraries.